Hand out a batch of Company Trolley Coin Keyrings and they'll last years - week after week of shopping and daily use. keep one of these Company Trolley Coin Keyrings attached to your keys and you'll never have to use the hand baskets again - you won't forget the Company Trolley Coin Keyring that's already with you! Just decide how many you need and we'll ensure that they all reach you printed up with your business details and company logo. Our Company Trolley Coin Keyrings are keyrings that hold a £1 coin for you to use in your trolley at the supermarket. Gain some valuable brand-name exposure with our Company Trolley Coin Keyrings freebies! To find out more about our Company Trolley Coin Keyrings click here and fill in the contact form and we'll get straight back to you. 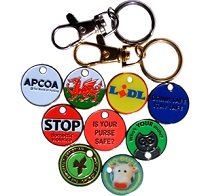 Other promotional and personalised items besides our Company Trolley Coin Keyrings click here.